Jeff, can you tell our audience a little bit about your professional background and your ministry experience? From my earliest memories, I have loved understanding how things work. Growing up, I planned to follow in my dad’s footsteps and pursue a chemistry career. While I find chemistry fascinating, I loved my first physics class in high school. So, I went to Iowa State University and received a BS in physics with minors in astronomy and mathematics. In graduate school, my focus shifted slightly to high-energy astrophysics where I investigated objects that emit gamma rays with millions of times more energy than those that produced the Incredible Hulk. I now work for Reasons to Believe (RTB)—an organization seeking to bring the gospel to those people interested in science. 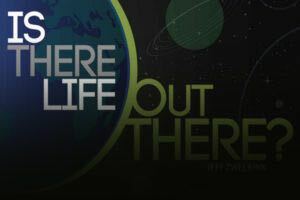 A large part of my job at RTB entails speaking and writing about intriguing topics where science and theology overlap, like my most recent book Is There Life Out There? This is a very interesting topic, but not one I’ve seen addressed in many books. Can you tell me why you decided to write an entire book about it? Two things conspired to bring this topic to my attention. First, astronomers started finding planets outside the solar system just over two decades ago. Since the initial discovery in 1992, they have found thousands of planets orbiting distant suns. These advances bring us closer (from a scientific perspective) to having actual data regarding how unique life on Earth is. Second, it seems like the topic of life in the universe fascinates lots of people. I noted a common theme in many of those discussions. Many Christians and non-Christians seem to think that the discovery of life “out there” would seriously undermine the truth of Christianity. To my knowledge, there are no books that describe the incredible advances in the search for planets beyond the solar system and how those discoveries impact the Christian faith. While this topic has been discussed philosophically (and theologically) by others, are there any new scientific discoveries in astrophysics that can help us determine if we are alone in the universe? As mentioned earlier, the biggest scientific advance is the ability to detect planets around stars other than the Sun. Although scientists have developed models to try and determine how many planets might exist or what they might look like, I can tell you that observations of exoplanets will trump any conclusions based on the models. Unfortunately, given the current capabilities to find exoplanets, scientists really have no data that tells us anything significant about whether these planets could possibly host life. In fact, we cannot say whether any exoplanet has water on its surface at this point. However, I expect that technological advances over the next two to three decades will allow scientists to begin addressing the central question of whether life exists elsewhere in our universe—at least for some exoplanets. One particular signature that would be a strong indicator of life on a distant world would be the presence of abundant (something more than 1–2%) oxygen in the atmosphere. What impact does this question (and even more importantly, the answer to this question) have on the claims of Christianity and the truth of the Christian worldview? As I alluded to in a previous question, many people seem to think that discovering life on another planet would mean that naturalism is correct and Christianity is wrong. One thing I found fascinating is that for centuries Christians have thought about the implications of intelligent life in the universe. As I investigated the truth claims of Christianity, I realized that the existence of life of any sort beyond the confines of Earth is a great theological question—without a definitive answer. At this time, I am convinced that any hypothetical discovery of life in the universe will still point to God’s creative work and ultimately help us understand God’s revelation better. As a Christian believer, how has the topic of your book challenged or strengthened your convictions? What are you hoping your book will do for those who read it? I hope the Christian reading Is There Life Out There? will gain confidence in the truth and robustness of the Christian worldview. If so, this will lead to a wonder and awe of this incredible universe and an anticipation of what scientists will discover as they explore it. The beautiful thing about this topic is that so many people willingly discuss it. The knowledge gained from the book will equip the reader to engage in these conversations in a way that readily introduces the Gospel and helps them better see the glory of God’s revelation. I hope the skeptic will find an accurate account of the current state of scientific affairs and gain an appreciation for how Christianity does not hinder the advance of scientific discovery. I bet you didn’t expect a book about alien life in the universe to actually increase your confidence in the Christian worldview, but that’s exactly what Is There Life Out There will do for you and anyone who reads it. I highly recommend this new book from Jeff Zweerink.